It is fascinating to watch learning developing naturally, away from objectives and theories and frameworks. I still struggle though with literacy – it can be evidenced at this early stage by such tangible, measurable skills, making it an all too easy point of comparison between Arthur and his schooled friends. From the beginning of this journey I told myself that there are good reasons why Steiner education steers clear of formal reading and writing before the age of seven, and that it’s no coincidence that many countries in the world wait until this age before introducing the sorts of structured learning that children in this country are introduced to at age four (or even younger). However I was a very early reader, devouring books for most of my childhood having picked up the skill seemingly by osmosis, and it’s hard not to impose that expectation on him. It’s hard also to ignore the niggling sense that he’s missing out by not being able to access the written word independently. I think in the back of my mind I was sort of hoping Arthur would just absorb the ability to read from the books we read with him. That we wouldn’t have to force him into anything he wasn’t ready for, but that we could avoid the awkward conversations with friends and family when they realise that not only does he not go to school but that he lacks this fundamental skill, too. It’s a bit silly, really. I know it’s more about me than him. His passions and talents are different to mine, and there really is no rush at all to jump through the particular hoops that his peers are being challenged with in the classroom. I am also aware that from a very early age I was desperate to please, to have my worth validated by people telling me how well I was doing. Arthur seems to have none of this need, and for that I am very grateful. Over the years I have dabbled in the synthetic phonics that forms the basis of literacy teaching in primary school. I attended a training course as a secondary school English teacher some years ago and was dumbfounded by the principle – that children would be taught to decode letters and sounds through isolated words, many of them nonsense, ignoring the clues of context, meaning and illustration that are essential to the process of reading in the real world. It struck me then that the real attraction of this system for the government was how easy ‘progress’ in it is to measure (progress of children and, perhaps more importantly, progress of teachers and schools). 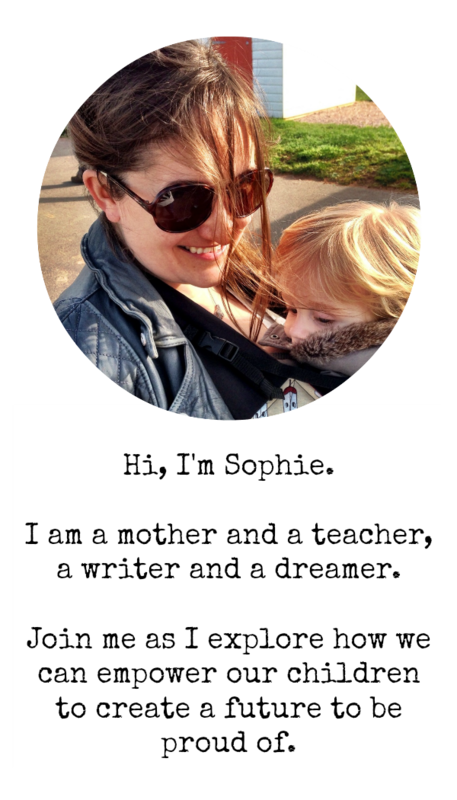 Whether it helps children read for meaning is questionable – and whether it can imbue in children the love of reading that will set them up for a lifetime of learning and pleasure is highly unlikely. Literacy is a complex beast, and one that is about far more than the ability to decode and reproduce letters on a page. It is about understanding narratives and the themes and characters that drive them. It is about recognising patterns in images and sounds and knowing how those patterns can be used for effect. It is about feeling the power in a word and applying that force in a multitude of different contexts. In our education system these things come later, after the mastery of the alphabet code, but the logic in that is debatable. He loves it when we read to him, from picture books to chapter books – Roald Dahl is his current favourite. Most nights he goes to sleep listening to audio books after his reading session with (usually) Daddy, and sometimes stays up for an hour or more just letting the words create worlds inside his head. He loves theatre and movies too, appreciating the wealth of different storytelling devices they involve and discussing the way that worlds are brought to life through the interplay of words, images and sound. His own storytelling skills are getting increasingly sophisticated. He retells the stories he hears and watches (from Winnie the Pooh to Star Wars) through games and role-play, creating scenes with lego or puppet shows with his soft toys. He makes up his own tales as well – sometimes he shares them with us, but more often I hear him talking to himself as he works through the narrative. He loves to play with words, experimenting with the way they sound through songs and poetry and jokes. 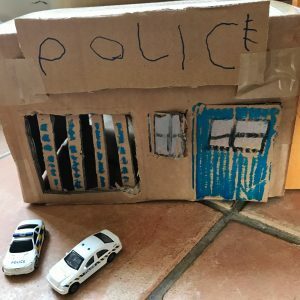 He was given some Dr Seuss books for Christmas, and for weeks afterwards he wanted to read nothing else – giggling with delight at the wordplay and joining in as it became increasingly familiar. His playfulness is beginning to lead him into the world of phonics too. He loves to play ‘I Spy’, and often asks what letters make up words. He asked me to spell my name the other day and I turned the question back on him – he managed it all apart from the ‘ph’ becoming ‘f’, which makes far more sense anyway. He spots words in the world around us – on signs or clothes or crockery – and spontaneously sounds them out. 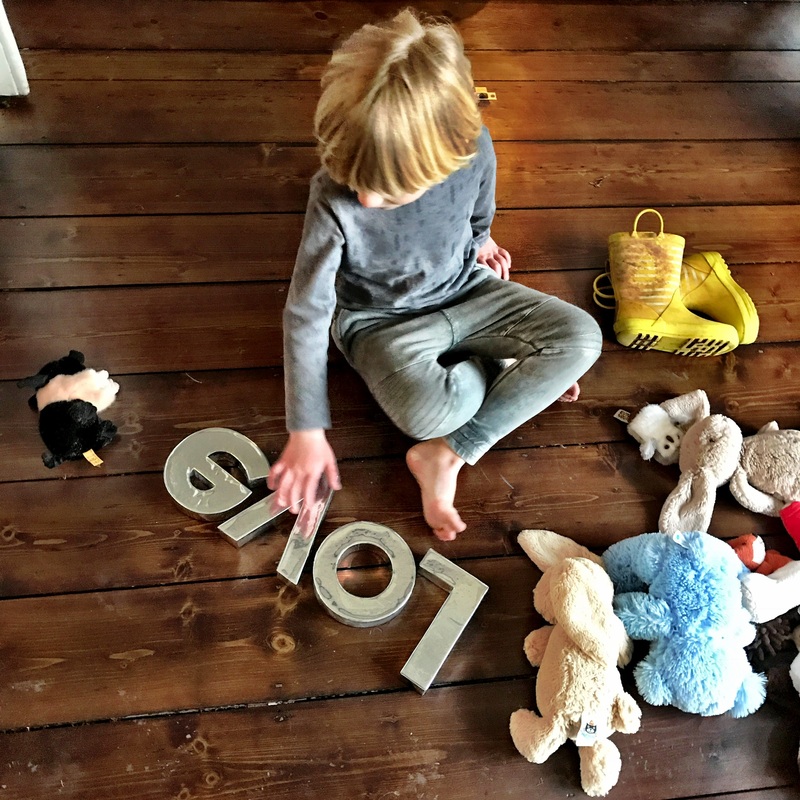 He likes to try to create words too with his magnetic letters – or any others he can get his hands on. Often the results aren’t strictly accurate, but it’s the independent drive to learn that makes me smile. He’s showing that interest with writing too. 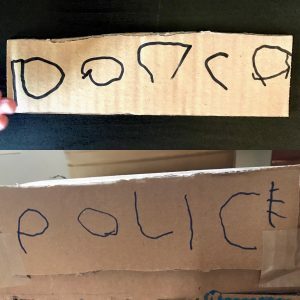 We were building a city out of cardboard recently, and he wanted to label the police and fire stations himself. He asked me to write the words for him to copy – his first attempt frustrated him and he almost gave up, but instead he tried again and was so proud with how much closer his second try was to what he was trying to achieve. It made me think about how many times he would be force to repeat the action of writing letters and simple words if he were in school, an action that he would have no intrinsic motivation to complete, and how much time that might waste in comparison to simply being ready, having the desire to do something and focusing his mind and body on completing the task the best he could. Arthur’s literacy might not be easy to measure, it might be messy and it might not match the ‘expected progress’ of his peers, but it is heartfelt and it is honest and it is his. And however much it might be my personal achilles heel in terms of trusting my son to learn in his own way and at his own pace I know, deep down, that he is doing just fine.